Invest in your health and comfort with the DiploMat Anti-fatigue Mat /Standing Desk Mat. Designed for use with our award-winning Stand Steady standing desks and ergonomic work accessories, the DiploMat is ready to form alliances with your suffering joints, legs, knees, and back. Whether you're engaged in tense negotiations on the retail floor, in the office, or your kitchen, you can improve your overall health and well being with our highest grade foam mat. This diplomat will help you break relations with your sitting life! 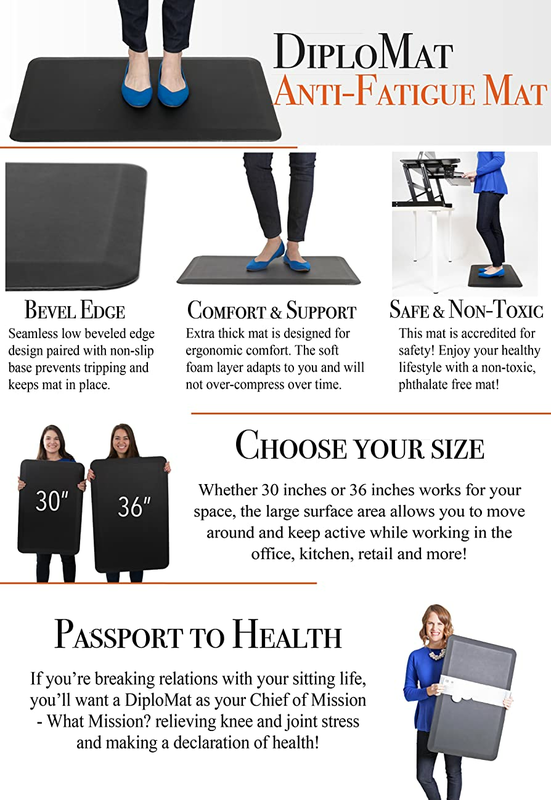 RELIEVES PAIN: The DiploMat Anti-fatigue Standing Mat can help protect your legs, knees, and back from pain while standing at the office, in your kitchen, garage, on the retail floor, or wherever you stand when you work! HELPS PREVENT FATIGUE: By providing cushioned support, you can stand longer and in better comfort. SAFE: Accredited for safety, your new the DiploMat is non-toxic and phthalate free, plus it features a seamless, low beveled-edge design which prevents tripping, and a non-slip base which holds the DiploMat firmly in place! DURABLE: The waterproof, stain and abrasion-resistant outer surface is easy to clean, while a soft foam inner layer adapts to the contours of your feet and will not over-compress! This mat is perfect. My feet hurt less when standing, just the right amount of support and comfort. And that's a good thing! I was standing and writing for two hours. I have the desk and the recommended gel mat to stand on. I could just think about my writing, not about what part of my body was getting cranky. Next time, I will set a timer to make sure I vary my position with my ball chair as recommended. Great product, at a much better price, than the competition. This product is everything I needed, and more. Day, Thank you for reaching out to us today. My wife works from home and loves her new AIR37. She stands up most of the day at her desk and the AIR 37 is perfect for her and just the right height. The reason we bought our new AIR 37 is when we were doing some research on all the adjustable height desks, your customer service folks answered all our questions and were very patient with us. Thank you very much!!! Surprised at how easily it goes up and down, even when loaded. I had worried about the quality because I bought it without having seen one. but I am very pleased with this purchase. I am starting to feel better and I am only sorry I waited so long to start standing up.